Gartelmann Wines has continued its success at the Orange Wine Show, being awarded the Trophy for Red Wine of the Show and Trophy for the Best Shiraz for its 2015 Gartelmann ‘Diedrich’ Shiraz. The 2015 Gartelmann ‘Diedrich’ Shiraz is one of Jorg and Jan Gartelmann’s flagship wines, and testament to their decision to source fruit from the cool climate region of Orange. We have been excited by the quality of fruit coming from our Orange region growers. Our 2014 Gartelmann ‘Joey’ Merlot was awarded at the previous Orange Wine Show, and this is gave us confidence to broaden our range of Orange wines. The Gartelmann range now comprises three Shiraz including a Hunter Valley Shiraz, Mudgee and the awarding winning Orange Region Gartelmann ‘Diedrich’ Shiraz. We have three completely different styles of Shiraz, all from within the NSW region. This shows the diversity of regions, from the warmer Mediterranean influenced Hunter Region through a warmer, earthier Mudgee style to the heights of Orange where the wines are spicier and more elegant. The Gartelmann ‘Diedrich’ Shiraz is now being made from the Orange Wine Region, with plans in place for a new Gartelmann ‘Wilhelm’ Shiraz from renowned older vines of the Hunter Valley. The 2015 Gartelmann ‘Diedrich’ Shiraz will be cellared and general release is approx. September 2017. Gartelmann Wines has released two new wines made from fruit grown in the cool climate of Orange. The new releases comprise the 2016 Gartelmann ‘Stephanie’ Pinot Gris ($25) and the trophy winning 2014 Gartelmann ‘Joey’ Merlot ($25). 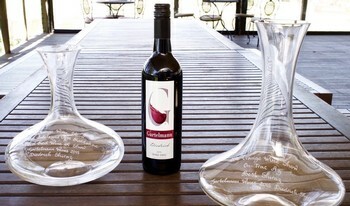 Gartelmann Wines was established by Jan and Jorg Gartelmann in the Hunter Valley’s Lovedale region in 1995. Over the past few years Jorg and Jan have experimented with grapes from regions further afield. The 2014 Gartelmann ‘Joey’ Merlot gained recognition at the 2015 Orange Wine Show where it was awarded the 2015 Trophy for the Best Merlot of the Show. We were extremely proud to be awarded this trophy. The wine subsequently won the ‘People’s Choice Award for the Most Popular Wine in the Show’. Considering there were almost 300 wines in the show, we were humbled that our Merlot was given this honour. The 2014 Merlot was then matured for 14 months in a combination of new French oak puncheons (25%) and one to three year old puncheons and hogsheads prior to bottling. The 2016 Gartelmann ‘Stephanie’ Pinot Gris, named after Jan and Jorg’s daughter, is the first release of this variety for Gartelmann. The grapes are from the southern foothills of Mount Canobolas at an elevation of around 675 metres. We wanted to make a Pinot Gris that showed good varietal character with some palate weight and gentle acidity. Our winemaker Liz Jackson did a fabulous job with these two wines. We have discovered some wonderful vineyards and grape growers in Orange, with the new wines adding significantly to our range of NSW Central Ranges wines. To hear all about what's happening at Gartelmann Wines, simply let us know your email address. We promise not to bombard you with emails; just a few regular notes with upcoming events, winemaker dinners, special deals on bin ends, etc. You can opt-out at any time.